Green screen technology is used in multiple scenarios. If you’re looking to enhance your videos and need a creative background to tell your story, a green screen is the best option. You can shoot your video anywhere without ever having to move! We’ve provided a list of 6 green screen tips to make your video stand out. Educators can point out lesson plans. For example, teachers can use a solar system background to point out planets. By standing in front of an image of the solar system, a teacher can illustrate where the planets are and explain it to students. Students can get creative with student projects. By creating their own newscasts, students can learn about current news and help educate themselves about culture, politics, and society. Business professionals can create impressive marketing videos. With green screen technology, businesses are able to build their brands by including their logos or important branding elements in a clean and professional way. The green screen or chroma key technique is used in many film or video productions as part of special effects. The technique is used to remove the background color from the subject standing in front of a green screen. The green background is replaced by images or video streams. Today, you don’t need to be a video professional to use a green screen. 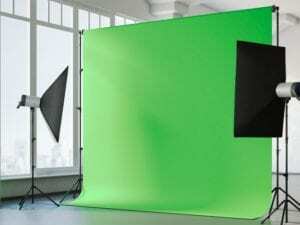 Anyone with green screen or chroma key technology is able to create their own desired backgrounds easily. There are many options in the marketplace to purchase a green screen. Often, a green screen will come with a blue screen. Both options can be used to remove your background. The only difference between using either color is the color itself. The best tip is to evaluate what you are wearing and the props you are using in front of the screen. It’s best to stay away from using anything with either a green or blue color, depending on what screen you choose to use. Those will be removed along with the background since it’s based on color. The green screen is most often used for chroma keying. The sensors of video cameras are sensitive to green, so it is often the ‘cleanest’ removal of your background. Green is also the color that is furthest away from skin tones and is one of the reasons why it’s preferred. Once you have your green screen, you can begin to build your lighting. Having good lighting can make your green screen nice and smooth. Lighting is extremely important to provide evenness and consistency in your background. Any area of your screen should be lit evenly and exposed correctly. If your lighting is lit on one side but not on the other, the removal of your background may not be clean. One tip is to use soft lights on your green screen. Using any hard lights will result in hot spots and unevenness of your background. We recommend using 2 or 3 back lights to light your screen. Having back lights will help separate the subject from the screen. Also, you should have a separate light aimed at the subject. 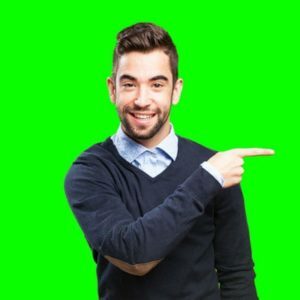 All of these lighting techniques will help with making a high-quality green screen. The more soft lights, the better! Shadows and movement affect backgrounds. While the background is lit evenly, the subject standing in front will also need to be taken into consideration. Lighting the subject helps but take note of the shadows behind them. Shadows can be a big challenge when you green screen. Shadows often show up when the subject is too close to the green screen. One tip is to make sure that the subject is several feet away from the screen. You can adjust your back lights and light your subject from the front. Take a step back and check to see if there are obvious shadows on the screen. If you are on your own, test the background before recording your whole video. You can also get a better idea of shadows by having the subject move or try moving your hand to see if the light picks it up and creates shadows. You can quickly eliminate shadows by moving your lights or your subject. Before you record, try picking out background images or video to replace your green screen with. You’ll want to take note of what is behind you and where to place your subject. If you are trying to illustrate a city setting, for example, situate your subject so that he/she is not blocking anything important that you would like to showcase. You shouldn’t feel that you have to stand still throughout your recording. One way to effectively use green screen is being interactive with it. Once the lighting is set, you should be able to work with the background and create fun situations. For instance, you can use ocean waves to illustrate that you are surfing. This can all be done with a green screen without ever having to be at the ocean. Another fun thing to do is to introduce props into your recording. As long as they are not the color of your screen. Have fun with props to help illustrate your story. Creating fun scenarios for your green screen will enhance your video. Use Screencast-O-Matic to create backgrounds. Choosing the right software to record your green screen is essential. Head to Screencast-O-Matic to get it done. It’s a one-stop solution for your video needs. Not only does it have an easy-to-use screen recorder but it has a ton of features that can help you take your video to the next level. Screencast-O-Matic is a widely used service by educators, business professionals, gamers and bloggers. It’s a seamless process. You can use the Screen Recorder or Video Editor to remove a color. Use the Video Editor to then add your background and make final edits. Add text, arrows, highlights and more with just a few easy clicks to enhance your video even more. What makes Screencast-O-Matic stand out from all the rest is that you can remove the background during the recording of your video as well as in the editing process. It only takes one slider to adjust your settings! It’s that easy! These two options give you creative flexibility to change your backgrounds before and during the editing process. Again, choosing the right software to create these situations are important. Having an easy tool that does it all can make your green screen video come to life. With these 6 Green Screen tips, we encourage you to bring your ideas to life through video. Shooting a green screen is supposed to be fun and easy! You don’t have to be professional video editors to get it done in post-production. If you follow several of these tips, you can begin to create engaging backgrounds to illustrate your ideas within minutes. You can do it all from your computer with just a few clicks!